Manchester beat combo Mike Sax and the Idols at Manchester University Main Debating Hall in 1964 supporting Spencer Davis Group. 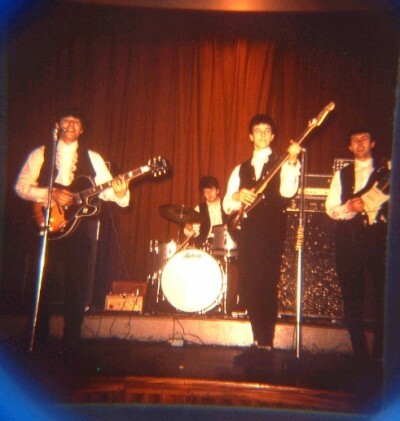 The Idols were a four piece band from Rossendale and Bury, consisting of Mike Sax (vocals), his brother Ray Sax (bass), John Sykes (lead guitar) and Graham Bailey (ex-Beatmakers drummer). They were originally called Mike Sax and the Vikings, but changed to Mike Sax and the Idols on securing a record and publishing contract with Phillips (Mercury) record label, and Dix Music Publishers. 'Don't Walk Away' was released in 1964. They became the Idols on their second release 'My Little One' in 1965. The Viking name was dropped because there was Carl Wayne and the Vikings already recording. At one time they were in the same stable as the Pedlars, Four Pennies and Hermans Hermits, under the John Lewis Agency. They played a 3-month season in 1967 at the Red Lion, Rimini, Italy, and disbanded shortly afterwards.